Admission to the joint study program is governed by the cooperation agreement between the universities of Innsbruck and Trento. Details of the admission and selection procedures are provided on this website of the University of Trento, which administers the joint program. The complete version of the curriculum reflects the currently valid version of the curriculum. It is for informational purposes only and is not legally binding. The legally binding version of the curriculum, including any amendments, may be found in the University of Innsbruck Bulletins. The examination regulation is an integral part of the curriculum, detailed information can be found under the paragraph examination regulations. The grade distribution table is a statistical representation of the distribution of all successfully completed examinations in a given programme of study or subject (based on all registered students for the programme or subject). The grade distribution table is updated in regular intervals. Explanation: An overall classification (mit Auszeichnung bestanden/pass with distinction, bestanden/pass, nicht bestanden/fail) – is awarded only for examinations that conclude a programme of study and consist of more than one subject (an examination of this type is not specified in the curriculum of this programme of study). The exemplary course sequence given below is recommended for full-time students beginning their study programme in the winter semester. 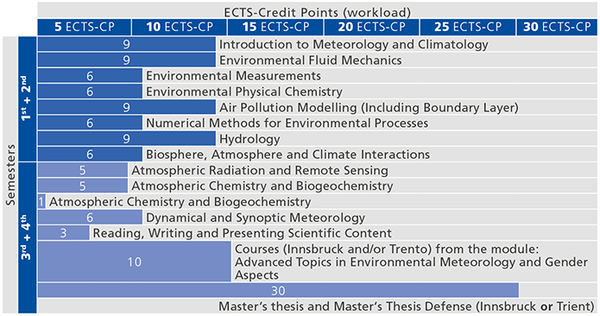 The table shows one possible course sequence for the master's programme and is not compulsory. Delays resulting from repeated examinations are not taken into account. The standard duration of the study programme is 4 semesters or 120 ECTS-Credits, whereby according to the Universities Act of 2002, a workload of 1,500 (real) hours per academic year must be fulfilled, corresponding to 60 ECTS-Credits (one ECTS-Credit is equivalent to a workload of 25 hours). atmospheric chemistry, hydrology, agricultural and forest meteorology, energy meteorology). They are able to use their knowledge and skills to work out methodologically sound solutions, and provide guidance for society in environmental problems in the mentioned areas. The Master in Environmental Meteorology also prepares for a further scientific career. Graduates can critically evaluate scientific and engineering approaches and advance certain areas within Environmental Meteorology. They can communicate their knowledge and results from their work to a wide range of audiences. They can critically evaluate results of their own work and those of others in their field and have sufficient knowledge of related disciplines (e.g. chemistry, statistics) to - if necessary - call in and understand experts in these fields. Studying at both an Austrian and Italian university in English leads to the development of a heightened sensitivity and accompanying skills to deal with cultural and socio-economic aspects of scientific or technological solutions. Graduates are able to characterize physical and chemical processes and their interactions in the atmosphere and environment based upon a profound knowledge of theory and observational tools. They can critically evaluate the output of numerical weather prediction models and make weather forecasts. They have the skills to analyze and discuss scientific literature and to present scientific results in writing and orally. The Master Environmental Meteorology qualifies graduates to work, for example, in the public administration (e.g., environmental office and corresponding public institutions), meteorological services, the private sector (e.g., energy demand and predictions for hydro, wind and solar power, agriculture, forestry, hydrology) and other related areas where aspects of environmental meteorology are relevant.